None of the first three games of Boston's American League Championship Series against Detroit have been what one might call a breeze. In keeping with that theme, Wednesday’s Game Four was decidedly not easy-Peavy. 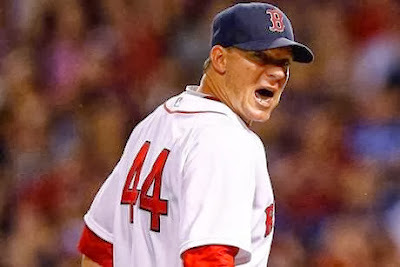 Boston starter Jake Peavy melted down in the second inning, walking three batters — one with the bases loaded — and allowed five runs on three hits. He finished the night with the loss and a line of 3 IP, 5 H, 7 ER and saw his postseason ERA blossom into a mushroom-cloud 21.00 as Detroit evened the ALCS 2-2 with a 7-3 victory at Comerica Park. On a glass-half-full note, the Red Sox relief corps of Brandon Workman (2 IP, 2 K), Ryan Dempster, Franklin Morales and Felix Doubront came on and stopped the bleeding with five solid scoreless innings, keeping the Boston bullpen’s scoreless streak in the ALCS alive and well. The Sox offence scored three runs late in the game, but the early hole Peavy had dug was too deep to scramble out of. On the other side of the mound, Doug Fister went six strong for Detroit, allowing one run on eight hits and walking one while striking out seven to earn the win. The salt in the wound in this game was the fact that the Sox out-hit Detroit for the first time in the series, putting up a dozen to the Tigers’ nine after coming into the game on the short end of a 23-12 hit count in the first three games. Coming into the game, the Red Sox were 44-7 this season when recording at least a dozen hits in a game. Jacoby Ellsbury bolstered his free-agent value with a 4-for-5 outing — just needing a homer to complete a cycle — and drove in a run to boost his average to .333 and Mike Napoli and Jarrod Saltalamacchia recorded a pair of hits apiece. On the flip side, David Ortiz went 0 for 5 and Stephen Drew and Will Middlebrooks were a combined 0 for 6 with two strikeouts each. In the home dugout, Jim Leyland shuffled his lineup and struck gold. After striking out 18 times for Detroit in the postseason to date, leadoff hitter Austin Jackson was moved down to eighth in the order and recovered his stroke, going 2 for 2 with two RBI and a pair of walks, while newly minted leadoff man Torii Hunter and No. 2 Miguel Cabrera chipped in with another two RBI each. Former Red Sock Victor Martinez, hitting cleanup, went 2 for 4 and is now hitting .400 against the Sox in the series. 1) You Don’t Know Jack, Son: After Victor Martinez singled to lead off the second, Jake Peavy issued free passes to Jhonny Peralta and Alex Avila to load the bases and stayed the course, walking Austin Jackson to force home the first run of the game and give the Tigers an early 1-0 lead. 2) Iggy’s Revenge: The next batter, another Boston exile, Jose Iglesias, grounded into a force out at second, beating out the throw at first to move Avila to third, score Peralta and push the Detroit lead to 2-0. 3) Hunting Season: Moving right along, the next man up, Torii Hunter, doubled to left off Peavy to cash in Avila and Iglesias to put the Tigers up 4-0. 4) Cab’s Here! : Still in the second, the eighth man to come to the plate, Miguel Cabrera, jumped into the pool by singling to center to bring home Hunter and give the Tigers a 5-0 edge. Tomorrow, in ALCS Game Five at Comerica Park, Game One starters Jon Lester and Anibal Sanchez will lock horns once again. Last time out on Saturday, Sanchez (1-0, 0.00 ERA) struck out a dozen and no-hit Boston through six innings, while Lester (0-1, 1.42 ERA) went six and a third, allowing one run on six hits and striking out four. First pitch is set for 5 p.m. EST.